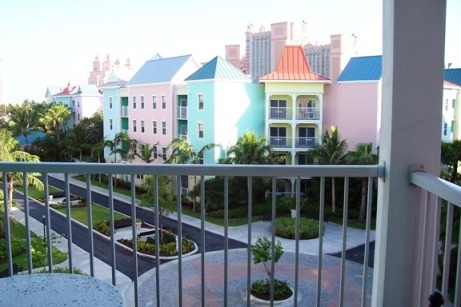 When developing a budget and deciding where to stay, consider Harborside Resort at Atlantis. Instead of a hotel room, you get your own unit with a kitchen and washer/dryer on a quiet, gated property. Many people fall in love with Atlantis and buy a yearly time-share at the family-friendly part of the resort. Whether you’re staying for a long weekend, a few days, a week, or more, staying in your own apartment makes good budget sense in several different ways. The accommodations themselves can be more affordable than the more luxurious rooms. Preparing meals in your own kitchen saves you from splurging on constant restaurant meals. Having a washing machine and dryer in the unit saves the cost of having clothes laundered as well as the headache of lugging along enough clean clothes for your whole vacation. 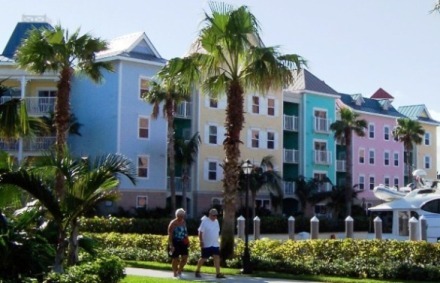 Take a look at the photos of the one-bedroom units and see the delightful Bahamian furnighings in gold and blue. Also check out the bedroom, bath, and laundry facilities. In addition, the onsite pool (with children’s section and baby pool), makes a relaxing escape from the huge, crowded pool areas in the rest of the Atlantis Resort. If you are considering whether an apartment may better suit your needs than a hotel room, check out Tips & Tricks to learn more about the delights of staying here.